It’s time to look beyond Croatia’s Dalmatian Coast and Slovenia’s Julian Alps. In the 1990s, the Balkans were rife with ethnic conflict, but the days of Milosevic are done and the new republics are quickly moving forward, with lesser-known sites ready to take on Dubrovnik’s Old Town and Slovenia’s Lake Bled. In case you weren’t clear, the war’s over. Travelers are now trickling back into one of Europe’s most unique cities. With a history of occupation by the Ottoman and Austro-Hungarian empires, Sarajevo is a mix of Islamic and Central European culture. It conjures two cities — Istanbul and Vienna — sitting side by side. Muslim, Catholic, Orthodox, and Jewish places of worship share a single city block. You don’t need to visit a museum to get a sense of the recent war’s impact. Buildings and sidewalks are still blemished with bullet wounds. Concrete indentations filled with red wax — known as Sarajevo Roses — signify that someone was killed there and are not to be stepped on. Remnants of the former National Library still stand, boarded up and closed off to visitors. Plaques and bouquets memorializing victims are prominently displayed in places like the infamous Markale Market, the bombing of which led to the NATO intervention. Even the bright yellow Holiday Inn holds significance. Originally built for the 1984 Winter Olympics, it was the home base of journalists covering the war, and some battles were even fought inside the building. Sarajevo is also the site of an older tragic event — the assassination of Archduke Franz Ferdinand in 1914, which triggered World War I. The spot where Gavrilo Princip fired the fateful shots is marked by a plaque next to the Latin Bridge. 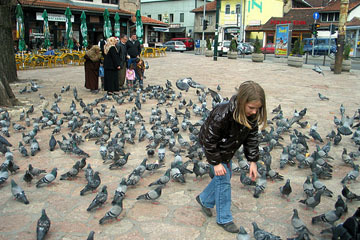 Like Sarajevo, this city was heavily hit by the Bosnian War between 1992 and 1995. 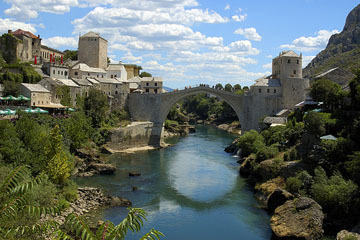 Its most famous landmark is Stari Most (Old Bridge) linking the city’s two ethnic communities: Bosnian Muslims and Catholic Croats. Originally built by the Ottoman Turks in 1566, the bridge was destroyed in ’93 despite efforts by residents to save it. A new bridge was constructed with international aid in 2004 and designated a UNESCO World Heritage Site. During the spring and summer, you might catch members of the Mostar Diving Club jumping from the bridge into the Neretva River below. Spend some time wandering the Ottoman Quarter of Kujundziluk, named for the craft of copper smithing. As you walk past the artist studios, cafes, and shops, you may hear copper smiths hard at work. Along the eastern side are mosques and Turkish houses dating to the 16th and 17th centuries. The city’s most famous is the Karadzozbegova Mosque, designed in 1557 by Ottoman architect Mimar Sinan. It has been rebuilt since the war. For a view of the city, climb up the minaret of the Koski Mehmed Pasha Mosque. * Tip: Travelers should take note that the train service from Sarajevo to Mostar is infrequent and runs at inconvenient times. For the most part, Belgrade is not very attractive, but give them a break; the city has endured 44 razings by invaders. They deserve a little leeway. Start with a visit to the Kalemegdan Fortress, located at the confluence of the Sava and Danube Rivers. 115 battles have been fought at this site in its 2,300-year history. The Upper Citadel now serves as a park, where locals like to relax and enjoy lunch. It’s a good idea to familiarize yourself with the Cyrillic alphabet before arriving. While guidebooks and tourist maps list all street names in Latin letters, the streets themselves are usually marked in Cyrillic script. Shopping, strolling, or people watching can be enjoyed on the pedestrian promenade Knez Mihajlova while you sip a coffee. For lunch, head to the ? restaurant, named as a result of a dispute between a previous owner and the clergy of the nearby Orthodox Cathedral. The Nikola Tesla Museum is dedicated to the discoverer of alternating current and contains Tesla’s personal effects and models of his inventions. Engineering students from the University of Belgrade are on hand to demonstrate the inventions. 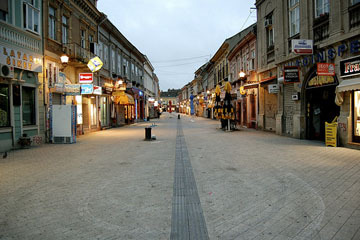 The bohemian quarter, known as Skadarlija, is good for dinner, with restaurants serving Serbian and Italian food. If you’re lucky you might get some live Serbian music. This neighborhood of cobblestone streets, shops, and art galleries was home to many writers and actors in the early 20th century. * Tip: It’s a good idea to familiarize yourself with the Cyrillic alphabet before arriving. While guidebooks and tourist maps list all street names in Latin letters, the streets themselves are usually marked in Cyrillic script — although this may soon change. If you can’t make it to Belgrade, Novi Sad is a sedate alternative to the capital. Serbia’s second-largest city and the one-time home of Albert Einstein was the target of NATO bombs in ’99. Remains of bridges destroyed in the campaign still sit in the Danube river. The Petrovaradin Fortress, which has never been taken by an enemy, sits on the eastern bank of the Danube. You can walk along its walls for a view of the river and the town, and the former stables now serve as local artist studios. The EXIT music festival in July takes place at Petrovaradin, featuring international performers in rock, blues, heavy metal, reggae, hip hop, and techno. As the world’s newest nation, gaining independence from Serbia in 2006, Montenegro almost feels like virgin travel territory. The town was destroyed by an earthquake in 1979, but rebuilding was completed in 1987. Budva, one of the oldest towns on the Adriatic, is the country’s top destination, with beaches and a small old town with cafes, shops, and churches. The nightlife along the promenade bumps into the morning. The old-town area is Venetian in style, a result of Venetian rule from the 1400s to 1700s. The town was destroyed by an earthquake in 1979, but rebuilding was completed in 1987. A 30-minute drive from Budva is Kotor, with another medieval old town, this one alongside Europe’s southernmost fjord. Like Budva, the town is full of churches, restaurants, clubs, and bars, making for a lively and noisy nightlife, but with less of the feel of a resort town. * Tip: Prepare yourself for huge crowds if you go in summer — more than 30,000 people come for the Bokeljska Noć, or Summer Carnival. Heading to Europe? Don’t hesitant to pose your logistical questions to our destination experts on the continent.